There were times in my life when, had I known how hard something was going to be beforehand, I probably wouldn’t have tried it in the first place. Caution would rule and I would be content reading about other people, more capable or better equipped, grinding it out. It’s almost always good that I don’t know in advance about the degree of difficulty, challenge, or stress involved in the endeavor, since life is much duller lived within my comfort zone. 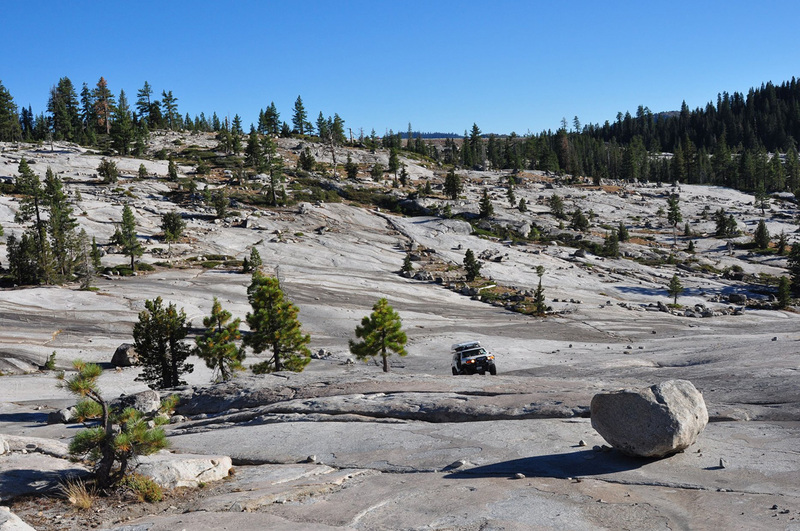 For me, attempting the Rubicon Trail in a relatively stock FJ Cruiser, with my brother, who has never spent much time off-road, was one of those times. I’ll admit it, I’m an overlander. I love the idea of the adventure, of getting out there and seeing what few people do. I like driving trails, seeing dinosaur tracks, petroglyphs, and the history of a place, before making camp near a beautiful vista, with a cold beer and great food, and following it all up with a marvelous sunset. Having a nice warm shower, sleeping in a roof-top tent, and waking up to a cup of Peet’s espresso before the next day’s stage, just adds to the attraction. 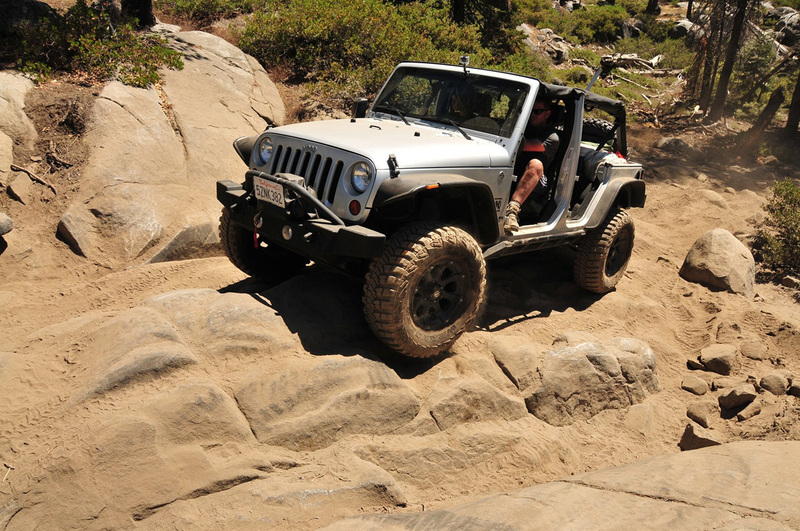 The Rubicon belonged to a bucket list from a much earlier time. 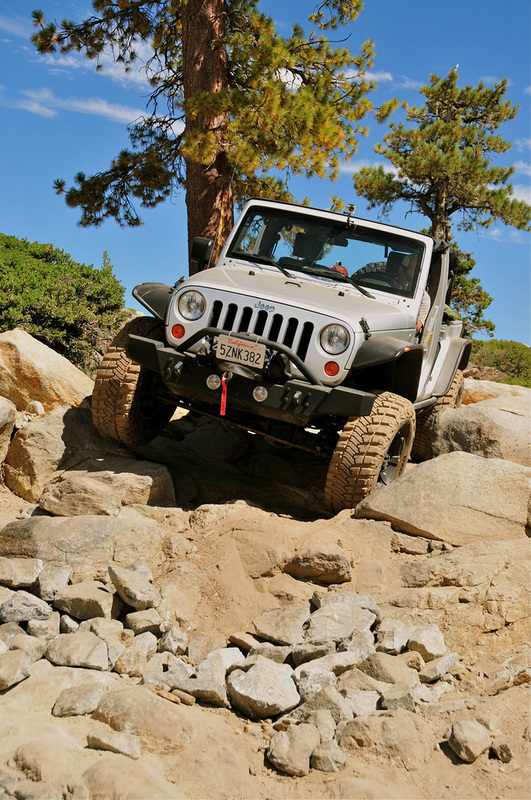 When my younger brother, Erik, purchased an older Jeep JK a few years ago, the Rubicon was squarely in his sights as he began to complete his list of modifications. 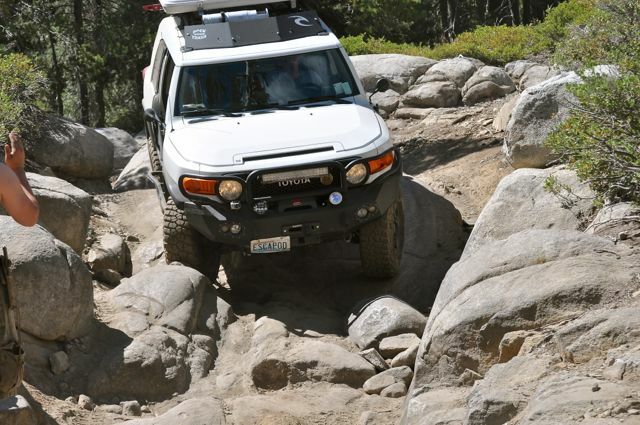 At family gatherings I always said, “Sure, I’ll do the Rubicon with you, no problem,” figuring that, if it ever came to pass, my overlanding experience would pull me through. 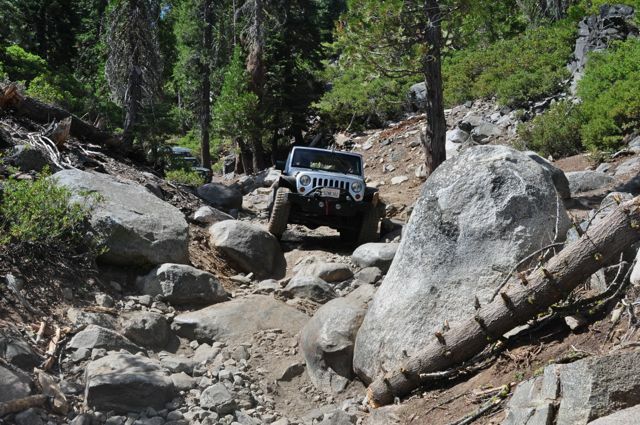 After all, hadn’t they just taken the teeth out of the Rubicon so that people could drive stock vehicles through it? I would be fine. Our history with the Rubicon had begun many years ago. We rode it on mountain bikes back in the ’80s and saw its challenges: the Gatekeeper, Granite Bowl, the Sluice Boxes Big and Small, Rubicon Springs and Cadillac Hill. It was amazing to us that a vehicle could negotiate that incredible procession of obstacles. We saw broken down vehicles, people in a panic for their survival, weeping over their ruined vehicles and lost hope of success. We always said we’d give it a try. Time went by and Erik completed his mods: 4″ lift, 35″ tires, front locker, 4.11 gears and cropped fenders! Wow, I had 32s (30s @ 18psi) and he was locked or limited-slip while I was open in the front with stock gearing. Meanwhile, my overland mods were progressing: ARB fridge w/drop slide, Maggiolina tent, hudson sprayer shower system, dual batteries, solar power, and a nice Snow Peak table. I took a solo trip from my home in Bellingham, Washington to Big Water, Utah, where I began an overland adventure from the Grand Bench to the bottom of Comb Wash—15 days solo (nearly 800 dirt miles) across southeastern Utah, on my way to the Overland Expo 2013, (the subject of a future post). Heck, my driving the Grand Bench solo, or driving down Flint Trail to the Dollhouse with my friend Doug, was an achievement akin to the Rubicon. Then the phone call came. Erik said, “We’ll do the Rubicon starting on August 15.” So it was on. Whether I really wanted to do it or not, I was going to do the Rubicon. How could I not? He was ready to go and, by default, was I too. I will look through the trail info and see if there are so good stops about 3 hours in… I like the idea of getting a jump! “There won’t be any destroying—I have to drive home! We were worried that we would get into a crowd, fall prey to peer pressure, and do something regrettable. We would by-pass the Little Sluice, park, walk back and watch to see what we could learn. Being ahead of the crowd would take some of the outside stress off and we would be able to deal with the natural stress of the trail.